OhMyVera! 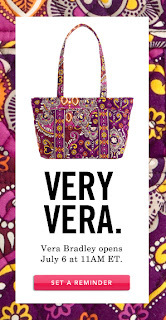 A blog about all things Vera Bradley: Vera Bradley on Rue La La! With the shipping charge added in, the deals aren't great enough for me to jump on. The East West tote is a pretty good deal but all the other purse styles being $40 is a bummer. Oh and the XL duffels at $50 is a steal. Good thing I'm not tempted by either of the patterns available.